Optimise your projects with these techniques. If your projects are stuttering and clicking on playback, we've got some potential solutions. There are a few things you can do within your DAW projects to increase the amount of CPU overhead available to them. In this walkthrough, we're looking at two of them: sharing effects and reducing synth voice counts. For more on optimising your music computer and DAW, pick up Computer Music 215, which is on sale now. Step 1: Let's take a look at a real-word example of a project that's pushed our system to its very limits. We've got a project open in Cockos Reaper (64-bit) on a 2011 MacBook Pro with an i7 quad-core processor. Surprisingly, this mere three-track project is stuttering and clicking like mad, even with the computer's respectable specs. Step 2: Our project is, admittedly, purposely set up to give us such awful results. We've done things we'd advise against, simply to give you an idea of how much difference even a few simple tweaks can make. We can use Reaper's awesome Performance Meter to suss out where the trouble lies. Select Performance Meter from the View menu. 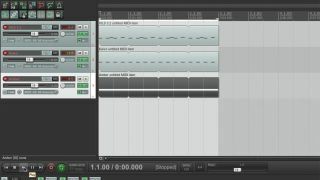 Step 3: The Performance Meter gives us a track-by-track breakdown of how much CPU each track is sucking up, along with any delay compensation needed by the plugins on those tracks. As you can see, our second track, with Madrona Labs' Kaivo on it, is giving the highest readings. That's not surprising, as Kaivo is a weird and wonderful no-compromises synth. Step 4: Before we start messing with Kaivo, let's take a look at the individual tracks by opening up each track's FX bin. Aha! Both the Kaivo and Amber tracks (2 and 3, respectively) have individual reverbs on them. It might be best to stick a single reverb on an auxiliary bus and use sends to route both tracks to that reverb. Step 5: Easy enough, then. Let's delete the two reverbs from our tracks. A quick look at the Performance Meter reveals that our CPU consumption has been reduced a little. We're still getting nasty clicks and artifacts. Let's look at our Kaivo interface. Note that there's a Voices parameter in the upper-left Key section. Let's try reducing that to 1. Step 6: Play the project again and take a look at the Performance Meter. That's made a real difference! CPU consumption is way, way down to less than half what it was, and now the project is playing glitch-free. Of course, it's a fine line - even pushing Kaivo's Voices up to 2 will get us into the danger area again, so this might be a good time to bounce to audio!